Most parents will know the challenges faced when trying to encourage healthy eating in young children. Fussy eating, picking in between meals and the influence of other children can all cause difficulties around the dinner table but there are ways in which healthy foods can be incorporated into children’s meals without them even being aware of eating them. How Much Should I Give Them? As the government and food standards agency suggest, at least 5 portions of fruit and vegetables should be eaten every day in order to maintain good health and keep the body functioning properly. The five portions should include a variety of different products not simply 5 apples (though this is better than none if no other fruit and vegetables can be tolerated). 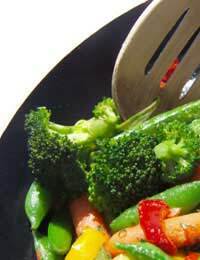 It is reasonable to suggest that vegetables should make up 3 of the 5 five portions as they contain less natural sugars which may put the teeth at risk of decay. Try and find produce that are dark in colour as these are generally better for you than paler items; dark green cabbage and berries and very good examples of this. If your child is still a toddler, and is taking plenty of milk in their diet, it may be more acceptable to encourage them to try different types of food as opposed to putting so much emphasis on getting 5 portions of fruit and vegetables into them every day. As a rule an adult portion is around 10 strawberries, a medium sized apple or 1 large carrot so make sure you are amending the size of the portion to suit your child’s frame and size. Sauces are a great way of sneaking in hidden vegetables into your child’s food. The basic sauce for dishes such as shepherd’s pie and spaghetti bolognaise can all contain around 5 different vegetables. When frying the mince boil in a pan items such as carrots, peppers, onions, parsnips, turnip and sprouts. Just before they are soft, blend them up until they are pureed. Add this to your drained mince and add gravy or tinned tomatoes, tomato puree as required. Making a vegetable sauce is easy, does not make a lot of mess and can really add to the flavour of a dish and means you are not spending money of ready made sauces or powders, all which may contain high levels of salt and additives. Making homemade fishcakes is an excellent way of introducing oily fish to the diet. Not many 5 years olds will sit down to a salmon fillet or steamed fish but they will love trying homemade fishcakes. When you first start making them don’t put too much fish in the mixture and make sure there is plenty of mashed potato. This will allow the child to try them and not be overwhelmed by strong fish tastes. On subsequent efforts you can gradually increase the amount of fish in the fish cake and indeed the type of fish. On the first attempt it may be worthwhile using simple white fish as this will not be seen as easily as more coloured fish such as smoked varieties or salmon. As the child learns to enjoy the fishcake, you can be more adventurous with your ingredients. If your child likes cheese, this can also be added to try and encourage them to eat the fishcake. Perhaps they might enjoy helping you make the meal and can act as a way of spending time together and as a learning experience for your child. Remember too that by making them yourself you can control the fat and salt content in the fishcake. The popularity of the milkshake and smoothie has increased dramatically in recent years. They are an ideal way of including fresh fruit into the diet and are sweet and colourful making them more attractive to children.Alternate your mixtures or add ice-cream for a special treat which will keep your child interested in them whilst enjoying the benefits of having so much good and fresh produce in their systems. It can be hard for parents to find ways of introducing fruit and vegetables to your child’s diet and even more difficult to monitor what they are eating when they are not at home. There are however ways of including fruit and vegetables into food without the child even being aware of their presence.